One might at first question my sanity when I say that I’m really excited about the opening of a new parking garage. But if you’ve tried to park on the Amalfi Coast before, you’ll understand the excitement. While the Amalfi Coast road is considered one of the most scenic drives in the world, the challenges of parking here make stopping anywhere along that drive difficult at best. 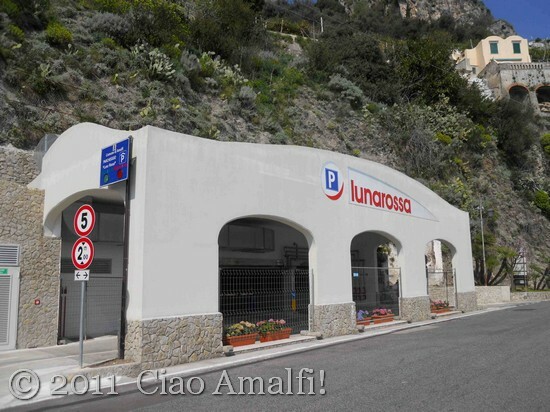 Parking in Amalfi just got a lot less stressful with the opening of the Luna Rossa parking garage located between Amalfi and the neighboring village of Atrani. 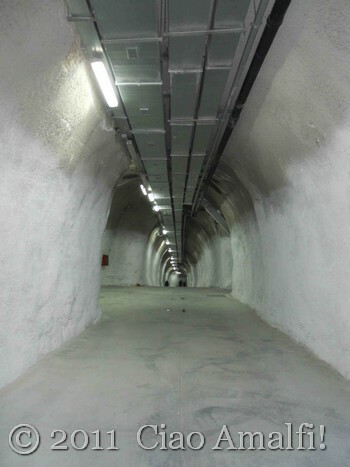 The small white entrance to the parking garage leads into the 4 level garage that has been dug out of the mountainside of Amalfi – an engineering feat that has taken five years of excavation to complete. 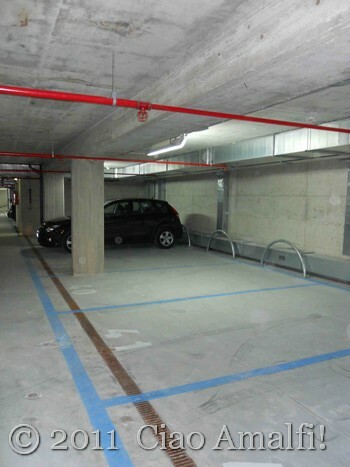 The garage has dedicated parking for the nearby Hotel Luna Convento, 204 parking spaces for cars and 30 for motorcycles and scooters. 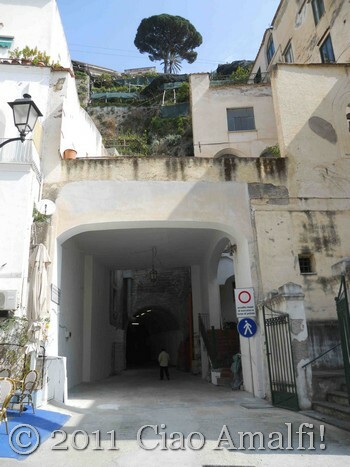 In addition to the four level parking garage, a pedestrian tunnel was built connecting the road to Piazza Municipio in Amalfi. Locals are already taking the shortcut, which makes the walk from the opposite side of Atrani to the center of Amalfi take only 5 minutes! The view when you enter the parking garage looking toward Atrani is quite nice. I have to admit that for a parking garage it has pretty nice views! We parked on the second level of the garage and took the stairs back down to the main level. The parking spaces are a relatively good size by Italian standards. If you can get that SUV to Amalfi, you’ll be able to park just fine. There are stairs and an elevator connecting the four levels of the parking garage. I can’t imagine the amount of work that had to go into excavating this massive space in the mountain! Everything comes at a cost, especially stress-free parking. The parking is €3.00 per hour, which may seem steep to some visitors. But when you travel so far to visit a town, it’s so frustrating to get there and find there isn’t any parking available. For much of the month of August, the parking area behind the port in Amalfi is full every day. Visitors would drive through town and not be able to stop! Hopefully, these 204 additional parking spaces will help relieve the stress of parking in town during the busy summer months. 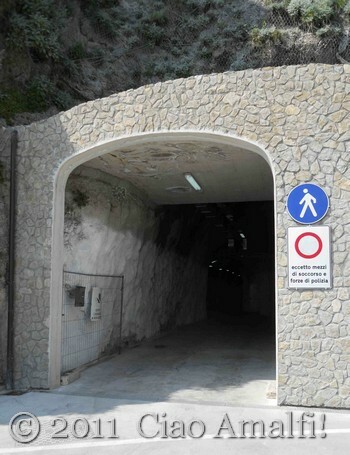 Now, I’ll take you on a walk through the new pedestrian tunnel connecting the Amalfi Coast road near the Hotel Luna to Piazza Municipio. The pedestrian tunnel is surprisingly cool, and will be refreshing during the warm summer months. 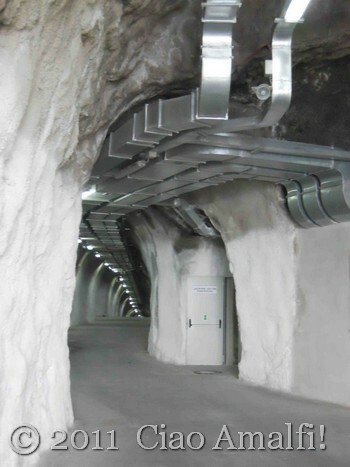 The tunnel was made quite large so emergency vehicles could pass through if necessary. The garage opened last month, and since has been quite the curiosity for locals. It’s a big achievement for Amalfi, and I hope it will make parking much easier for travelers who want to drive the Amalfi Coast road. And for those of you that that are curious, the name Luna Rossa means Red Moon and refers to when the full moon takes on that magical red hue. It’s also the name of a beautiful Neapolitan song called Luna Rossa. Here’s a bit of music to get you in the mood for driving down the Amalfi Coast! Ciao Pat! I think it was very well done. The exterior used to be there as some sort of small garage, I think. So they left that basically the same, if I’ve understood correctly, and just excavated the rest of the garage. It’s been under construction since the first time I visited Amalfi in 2007! How do we get to this parking garage from Praiano? 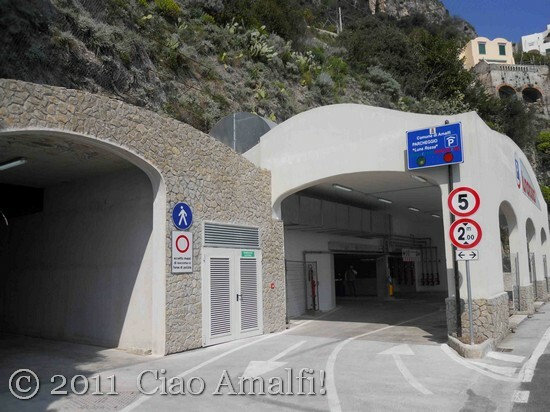 The Luna Rossa parking garage is just east of Amalfi before you go through the tunnel to Atrani. Can’t miss it! Absolutely brilliant, I was please to note that there is a reduced tariff for residents. Ciao Linda! Yes … very nice that there’s a reduced rate for the residents of Amalfi. I hope it will be useful for them as well! Ciao Rafael, Thanks for stopping by and for your comment! Unfortunately, I’m not sure when the parking garage will fill up, but between there and the parking lots in Amalfi you shouldn’t have too much trouble. It is first come and there are no reservations. Not sure what to recommend about parking in Positano, because we don’t drive there often during the busy season. I believe there’s a small parking garage, but I’ve heard it’s quite expensive. You can take a ferry from Amalfi to Positano, which is also a very enjoyable and affordable way to see the Amalfi Coast from the sea. Have a great visit! I plan a trip to Italy in April, including a few days in Amalfi town. While the idea of the garage sounds great thee information about it is probably hidden in the mountain (like the garage itself) – I cannot find it on maps. Can you tell me how far do I have to walk from may parked car to town (let’s say the Duomo)? Are there any stairs? Ciao Margalit, Unless it’s a recently made map, you probably won’t find any mention of the parking garage. 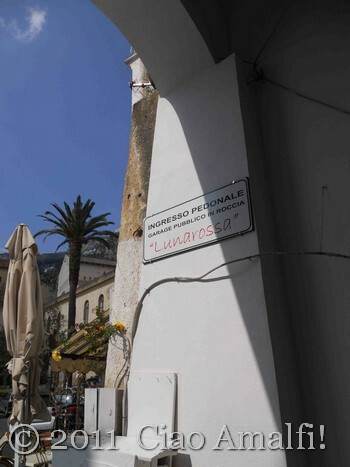 However, it’s right between Amalfi and Atrani not far from the watchtower that is part of the Hotel Luna. 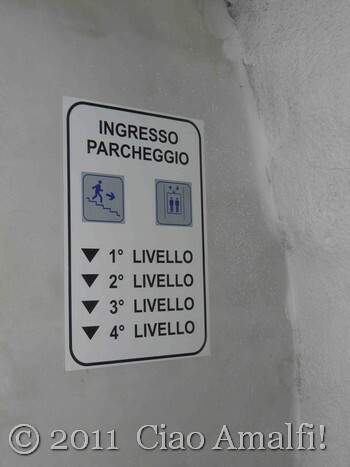 You can walk from there to Amalfi via the tunnel in a few minutes without any steps. However, I’m not sure about long term parking. You might want to check with the hotel where you’re staying about options. Have a lovely trip to Amalfi this spring! I have booked Fontana Hotel at Piazza Duomo. What Parking seem to be the closest to the Hotel? Ciao Micky, I would recommend checking with the hotel where you’ll be staying since they’ll be able to help you in the most convenient way for parking. Thanks! We are planning on visiting Amalfi Coast in a couple of weeks, 3/23/14. I wanted to check and make sure that the parking garage is open year round. Is there a day rate or is it just hourly? Hi Christina, Yes, the parking lot is open year round, but I’ve not parked there recently to know the rates for hourly or daily. Hope you have a wonderful visit to the Amalfi Coast! Hello, I will be driving from Sorrento to Amalfi. The Luna Rossa Garage looks perfect. However, I’m finding it impossible to locate the actual address. Does anyone know the address, or have coordinates? Many thanks. We are going to visit the Amalfi coast in August 2014. We are a family of 7 and will be hiring a car. We will be staying in Sorrento and would like to visit Amalfi, Positano, Ravello, Capri and Pompeii. Do you think that it is better to go by bus since parking is a problem? Do we find places to park in Positano? Hi Sonia, thanks for your comment! I’d say that parking in Positano would be the most challenging. There is public parking in both Amalfi and Ravello, but it’s much more limited in Positano. If you’re staying in Sorrento, you might consider going to Positano by bus and then perhaps driving to Amalfi and Ravello on a separate trip if you have enough time. Have a wonderful time! We are travelling from Amalfi to Capri and would like to know if we can park our car in your facilities from July 14 to 16. We would pick up the car during the afternoon of July 16. Hi Andre, The Luna Rossa parking garage is definitely not my facility, and I’m afraid I can’t help you with details like your request. If you’re staying at a hotel, you may want to request more information about parking from them. Good luck with your travel planning! We are a group of 8 staying in Amalfi via airport in Naples. We are debating whether or not to train, bus, ferry for the 10 day duration of our trip as we want to hike the Path of the Gods, day trip to Naples, and Capri. Parking costs more then the car but its close to all of our bus/train/ferry costs. We were gonna grab two Fiat 500’s, is there any chance of scraping together free street parking once in a while between August 27 and September 5th?? Any advice is super appreciated! Hi, we would like to visit Amalfi cost in beginning of April: from 4 .04.15 to 09.04.15. Is it the desicion -not to hire a car and use public transportation is right ? Our base will be in Maiori. What is the biggest problem:parking/driving/traffic? This is a Easter week,is not it? Please I need to make a right move. Thanks. 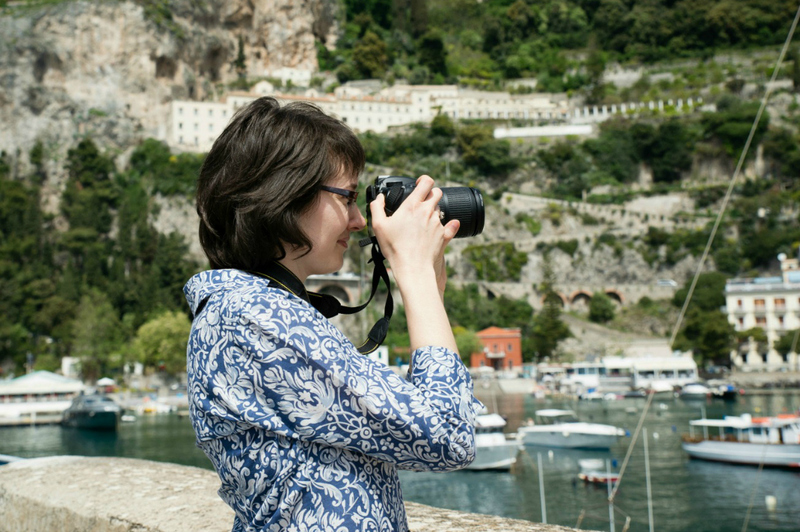 It’s hard to provide much help without knowing where you plan to visit on the Amalfi Coast during your stay. In Maiori your only choice for public transportation will be the bus. I would say the biggest problem is the cost of parking, along with the narrow and twisty road being intimidating to some drivers. Easter is Sunday, April 5th and there will be a lot of traffic on that day, but even more the day after, which is called Pasquetta. Hope that helps! How far is Atrani from your car park? Can I walk there? 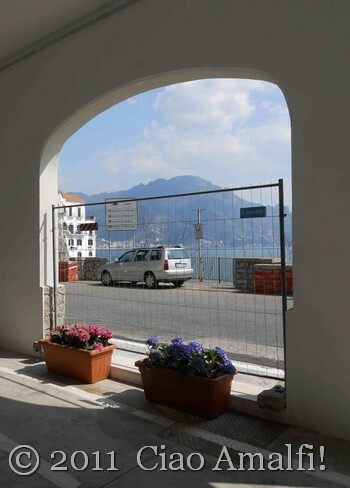 Do you have recommendations for parking in Ravello? Hi Nick, The Luna Rossa parking garage is between Amalfi and Atrani and easy to walk to both villages. In Ravello there is a parking area below the town’s main piazza. If you follow the signs for parking you’ll find it. Have a great time! 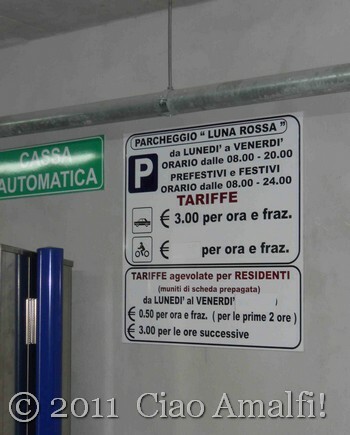 Is the Luna Rossa car park open overnight and if so do you pay for overnight parking? I’m visiting at the end of March — do you have a discount for a four day pass? we are staying in Atrani for a Week and we’re coming there by rental car. We are staying in an apt. and the host recommended we should get a parking spot in luna rossa. is it possible to leave the car there for a whole day, and if so, how much would it cost? is it possible to purchase say a day-pass or week pass to get it cheaper? 3 euros for one hour seems a little much considering we’d like to keep the car there for maybe a whole day. Hi Sebastian. we will be staying in Amalfi design sea view in October and the owners have said to park our car the daily rate is 20 euros but that means you have to leave it there. Like you, we are hiring a car for the week so that we can travel around and see the place so its looking like 3 euros an hour or 20 euros not to move it from the car park… seems a bit steep to me…. Hi Julie, I don’t know a lot about parking fees, but from what I’ve heard that is not especially expensive for the Amalfi Coast. I know that some of the parking lots are fairly inaccessible, so I imagine that is why they were saying it is best to leave the car all day. But hopefully you can work out something with your hotel! My family and I (6 total) are visiting Positano this coming August. Renting a large van. We are considering dropping off everyone and our luggage in Positano, Via Guglielmo Marconi. Then having my husband drive the vehicle to your location and taking the ferry back to Positano. Is this doable? Will your carpark house larger vehicles? If so, do you allow for overnight parking? If so, what is your exact address in Amalfi? And what are your fees? Hello Laura! Thanks for a good information about Amalfi and garage parking. We are 3-4 bikers as will visit Amalfi in the middle of June comming summer. I wonder how diffucult it can be to find a parkingplace for our bikes meanwhile walking around inside Amalfi city in that time of the year? And, is it the same price at the garage for both MC´s and cars or is it different prices ? Is it any specific rules for parking MC as long as the bikes doesnt disturb the roadtraffic and not stand in the way for anyones houses or stores? I mean are we allowed to park proper on the side of the walk if it not harm anyone or anything? Hey again, I Wonder,.. I seeked for it on Basecamp, Google Earth and also on Google maps and found this one , is this the parkinghouse? Hi Carin, Yes that’s the parking garage! We will be arriving in Amalfi town September 1st and leaving the 7th. Where might we find a less expensive place to park?